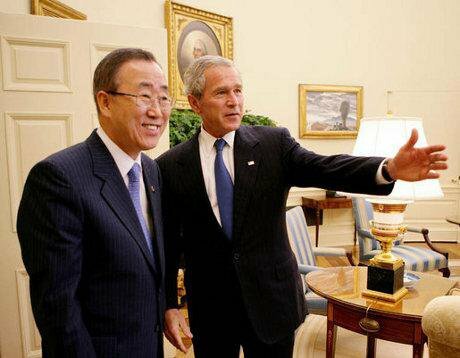 "Inoffensive": Ban Ki-moon takes a steer from one of the men who picked him. Eric Draper / Wikimedia. Creative Commons. In recent decades he has played an important public role, reminding the world of the UN’s basic principles, suggesting ways to apply them to new problems and mobilising world public opinion to confront major challenges. He’s the nearest thing we have to a world leader. When the incumbent, Ban Ki-moon, steps down in two years’ time, a new SG will be needed. How will he be chosen? Might it even, for the first time, be a she? The charter says only that the SG “shall be appointed by the General Assembly upon the recommendation of the Security Council”. It was the assembly which decided, in 1946, to ask the Security Council to “proffer one candidate only” and that the first SG should be appointed for a five-year, renewable term. So those practices could be changed without amending the charter. Only since 1981 has it been generally accepted that no SG should serve more than two terms. And the idea that the post should rotate among the assembly’s five regional groups has never been clearly defined or fully applied. In practice, it’s the five permanent members of the Security Council who have effectively made the decision, since each can veto a recommendation to the assembly. Last time, in 2006, Russia nixed the idea that it was eastern Europe’s “turn” (because it did not want a Latvian or Polish SG), while China insisted that it was Asia’s “turn”. The US quietly agreed with China on Mr Ban as the most inoffensive Asian candidate. The other two permanent members, the UK and France, had nothing to say. That was a shameful abdication of responsibility. Among the privileges of permanent membership, the chance to influence such an important choice is hardly the least. One might have thought there would be a vigorous debate in both countries about how this influence should be used. Their governments could have been urged, perhaps obliged, to set out clear qualifications required of any candidate seeking to secure their support. In fact, there was almost no public discussion. Probably few people in either country even knew a choice was being made. He’s the nearest thing we have to a world leader. So it was left, in effect, to just three people: George W. Bush, Vladimir Putin and Hu Jin Tao. The General Assembly and world public opinion woke up to that fact much too late and missed the chance to insist on a better process. This time round we must not make the same mistake. That is why civil-society groups from around the world have launched a campaign, under the banner 1 for 7 Billion, calling for a fairer, more transparent and, above all, more effective procedure for filling this important post. They want the job to be advertised, with criteria for choosing the best person irrespective of national origin, a clear timetable and then a list of candidates—whose manifestos must include a pledge not to promise other senior posts to particular countries in return for their support, with a corresponding pledge from governments not to seek such promises. They want public hearings, at which candidates would answer questions from the media and the public as well as from states. They want the Security Council to give the assembly two or more candidates to choose between and the new SG to serve a non-renewable seven-year term, so that she or he doesn’t spend it running for re-election. We have two years to get those proposals adopted. Then let the best man or woman win.